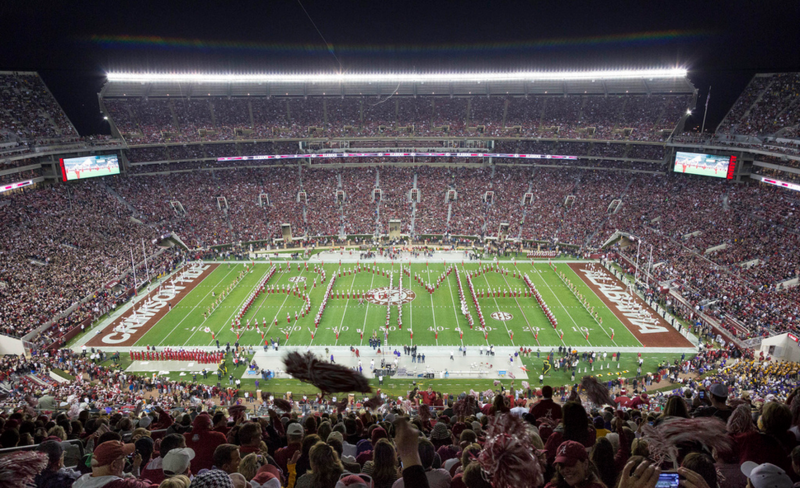 Today Bryant Denny Stadium is the fifth largest college stadium in the nation; however it took hard work and seven expansions to finally reach this point. The University of Alabama has played football for over a century, but it took nearly four decades before they began to play at Bryant Denny Stadium. Prior to the opening of Bryant-Denny Stadium, the Tide played at Denny Field and University Field. By the mid 1920s the University of Alabama decided it was time for a new football facility and built a 12,000 seat stadium. The Tide christened the stadium, originally known as George Hutchenson Denny Stadium, on September 28, 1929. Like every other college team, Alabama needed to expand their stadium due to the increasing fan support. The first of many expansions took place in 1937, when 6,000 seats were added to the east side, raising the capacity to 24,000. By 1946, bleachers were at both end zones of the stadium and the capacity reached 31,000. A new press box and 12,000 seats were added in time for the 1961 season, increasing the capacity to 43,000. Five years later the capacity increased to 60,000. In 1975, State Legislature renamed George Hutchenson Denny Stadium, Bryant-Denny Stadium, after legendary Alabama football coach, Paul “Bear” Bryant. The seating capacity of Bryant Denny Stadium increased again in 1988 when the upper deck was added on the west side, increasing the capacity to 70,123. Throughout the 1990s, as demand for tickets to Crimson Tide game increased, so did the size of Bryant Denny Stadium. In 1998, the east side upper deck was constructed, bumping the capacity to 83,000. This project included 81 new skyboxes, a video/scoreboard on the south end, new lights, an east side entrance tower and a brick façade for the facility. Before the 2006 season, a $50 million expansion project increased the seating capacity to over 92,000, with new seats and skyboxes. A grand promenade was constructed to connect the stadium to University Boulevard, which is lined with larger-than-life statues of the four coaches who have brought Alabama its national championships. This area was named the “Walk of Champions.” Also lining Alabama’s Walk of Champions are inlaid granite tablets that commemorate the school’s 29 Conference Championships and 16 National Championships. The seven story North End Zone Glass Curtain Wall gives Bryant-Denny the formal face it has always needed. 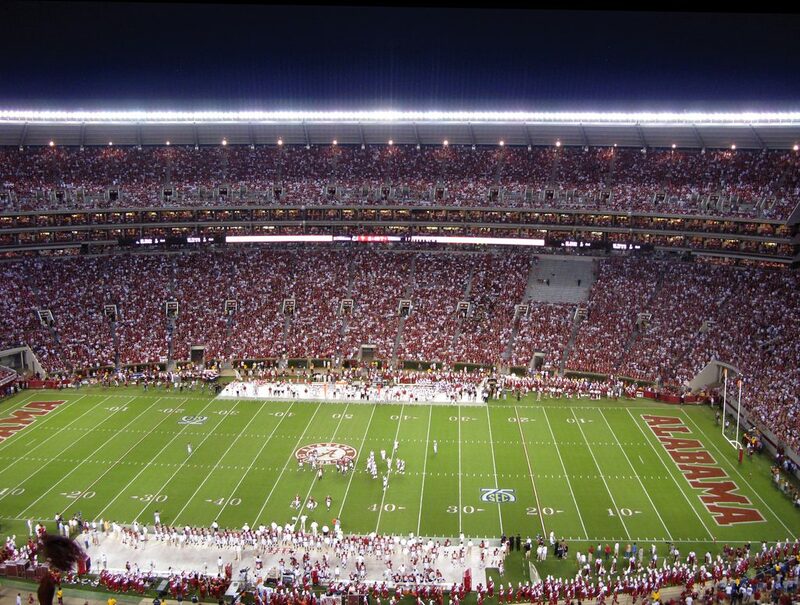 In November 2008, Alabama announced plans to expand Bryant Denny Stadium to seat 101,821 fans. This $65.6 million expansion was completed by the start of the 2010 season. It includes a 8,500 seat upper deck, 34 luxury seats, 1,700 club seats, a 1,500 seat stadium club and two new corner video boards, all on the south side of the stadium. The latest renovation plan to Bryant Denny Stadium was announced in August 2018. This multi-phase project will be completed in phases following the 2019 season. It includes removing a large number of seats in the south end zone upper deck and replacing with a new HD video board, reducing the overall seating capacity to well below 100,000. Additionally the press box will be relocated to the east side of the stadium, replaced by 10 new luxury suites. Phases II and III include updating the south end zone club, re-configuring the existing concourses and renovating the luxury boxes.